City Council has an agenda item for Monday, December 14th to discuss proposed sidewalks & PARTIAL bike lanes 8th. 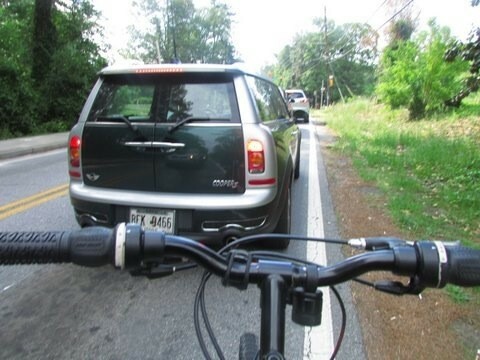 TODAY: Please send a short email to our mayor, council & staff in support of bike lanes along the FULL segment on Tilly Mill Road between North Peachtree and Womack. Share this message on Facebook, Twitter and email your friends. Bike lanes end at Cherring. From Cherring to Womack, there is proposed wide, 13-ft motor vehicle travel lanes with painted “Sharrow” markings on the pavement. Our ask: Bike Lanes along the FULL segment from North Peachtree to Womack. Why? Safety & Traffic calming. We believe that public safety should be the number one criteria for the designs of our streets. 13-ft travel lanes will cause motor vehicles to speed faster through this residential corridor en route to destinations such as Georgia Perimeter College. Narrow the travel lanes to 10-ft, like they are on Dunwoody Club Drive. Narrower lanes will help traffic calming. Slow down speeders and make it safer for the residents that live on Tilly Mill to simply get out of their driveway easier & safer. And you’ll only need another two feet to get 4-ft bike lanes. Adding bike lanes provides an additional safety buffer between pedestrians walking on the sidewalk and motor vehicles, too. Sharrow markings are NOT a bicycle facility. They offer no separation between metal boxes on four wheels and persons on bicycle. They will not encourage the 10-year olds or Peachtree Middle School children to ride in the middle of the street “sharing the road” with cars & trucks. Over 280 active persons have endorsed Dunwoody’s Complete Streets Policy, which recognizes that transportation projects involve safely moving PEOPLE, which include sidewalks and bike lanes; and not just strictly roads for motor vehicles. . If you haven’t yet, please sign the on-line petition, click HERE. Scroll down for more supporting reasons. and cc: Michael Smith, Public Works Director; Mindy Sanders, Public Works Project Manager; Eric Linton, City Manager; Jessica Guinn, Assistant City Manager. If you can make it, please come to the meeting, sign up for Public Comments and voice your support. Come to City Hall by 5:45 pm and sign up for Public Comments and Sound Your Voice for Bikes. You’ll get three minutes to speak to Mayor Davis and our Council members on why you think this is important. Before the meeting starts at 6:00 pm, be sure to fill out a Public Comment card & hand it to the City Clerk before the meeting starts. Address: 41 Perimeter Center East, Dunwoody, GA 30346. Ground Floor. Here’s a video extract from the City of Dunwoody Council meeting on June 8th, 2015 of Public Comments regarding bike lanes and safe places for persons to ride. 9 people spoke in support and 1 against (The opponent lives on Tilly Mill). It is expected that the City Council will have a second discussion of this project on Monday, June 8th. If you can make it, please come to the meeting, sign up for Public Comments and voice your support. come to City Hall by 5:45 pm and sign up for Public Comments and Sound Your Voice for Bikes. You’ll get three minutes to speak to Mayor Davis and our Council members on why you think this is important. Before the meeting starts at 6:00 pm, be sure to fill out a Public Comment card & hand it to the City Clerk before the meeting starts. Details on Facebook click HERE. This is a great video to understand the process of how our Dunwoody City Council decides where a new bike lane may — or may not — get installed. It’s conversational and is about 25 minutes long. Starts with a brief explanation by a Public Works staff member and then the Council takes it from there. At the end, you’ll hear City Manager, Eric Linton close with the takeaway that he’ll work with staff, re-work a proposal and present to the council at the next session, which is scheduled for June 8, 2015. On Tuesday, May 26th, the Dunwoody City Council will be hearing from our Public Works staff on a proposal to add new sidewalks and bike lanes along Tilly Mill between Womack & North Peachtree. 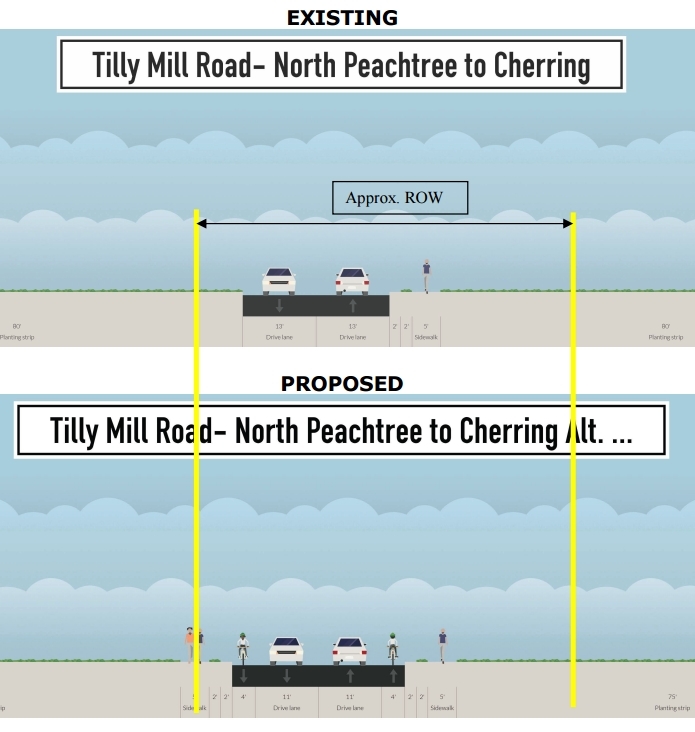 The staff proposal is to have bike lanes from North Peachtree to Cherring Lane, which will be absolutely terrific! For those of you that have ridden on this segment, you fully understand how uncomfortable and uninviting this part of the road can be. However, the bike lane stops well short of Womack by 1/3 of a mile and requires persons traveling on bicycle to merge into the motor vehicle lane. Most persons are not comfortable riding a bicycle with heavy traffic in the same space as a 4,000 pound metal box on wheels. 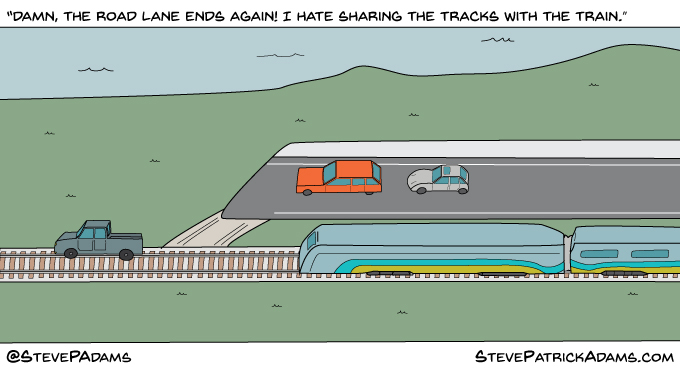 Instead, we’d like to see bike lanes along the full segment. 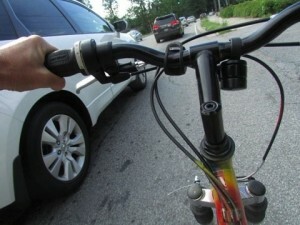 Photo along Tilly Mill from the perspective of a person on a bicycle. Perhaps one of these might be more appealing to you or your child? And, what would be even better is if you could come to the Council meeting by 5:45 pm and sign up for Public Comments. You’ll get three minutes to speak to Mayor Davis and our Councilmembers on why you think this is important. Before the meeting starts at 6:00 pm, be sure to fill out a Public Comment card & hand it to the City Clerk before the meeting starts. Each alternative includes new 5-ft sidewalks along the west side of Tilly Mill. Staff is proposing Alternative 3, which has the bike lanes ending near Cherring Lane, instead of going the full distance to Womack. For SAFETY, each alternative needs to include minimal 4-ft wide bike lanes to create a connected segment. 5 feet wide bike lanes are preferred. Reducing the motor vehicle lane width to 10-ft (As proposed both for this very same segment in 2010 by our Public Works and on Chamblee-Dunwoody with the Georgetown Gateway project) will provide 5-ft wide bike lanes. For LAST-MILE non-motorized CONNECTIVITY to important destinations, bike lanes need to be along the full segment. Within a half a mile of this street are high-demand destinations including the Dunwoody Campus of Georgia Perimeter College, Marcus Jewish Community Center, Brook Run Park and Peachtree Charter Middle School. Providing full Complete Streets facilities including bike lanes will offer a much safer alternative for nearby residents that may want to use their bicycle for these short trips. * In 2010, Public Works staff conducted a preliminary study and presented to Council to remove the center turn lane between Womack & near Cherring Lane. See their proposal attached below. Basic minimum is a 5-ft bike lane along the full segment. Near Cherring to North Peachtree: Same as Alternative 2 or 3 above, which include bike lanes. 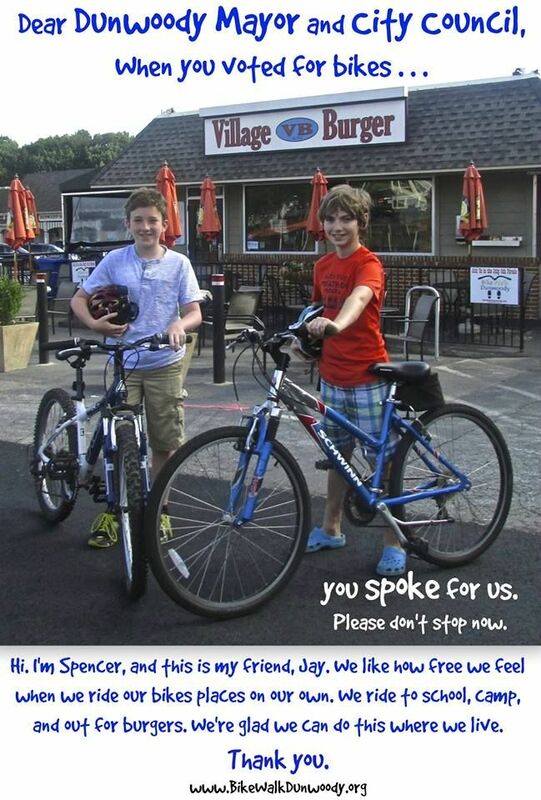 People like Spencer and Jay are looking for safe places to ride their bikes. Increases safety of all users of the street. By offering a continuous bike lane along this segment, persons traveling on bicycle will avoid “mixing” with motor vehicles. Think of the analogy of a car approaching a road ending and then having to merge onto a railroad track & travel along with a train in the same space. That is the way it can feel to a person on a bicycle in having to “share” the same space with a 4,000 pound metal box on wheels traveling at 35 – 40 miles per hour. 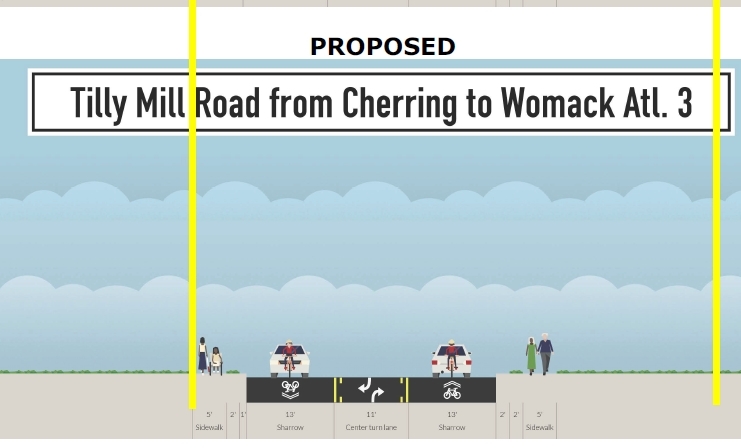 Without a basic bike lane connecting North Peachtree to Womack, persons on bikes will be greatly inhibited to use this segment. (Better yet would be a Cycle Track, aka “Protected” Bike Lanes, which incorporate a physical barrier separation between persons in motor vehicles and persons on bicycles). Good stewards of taxpayer dollars; as uses existing curb & gutter between Womack to near Cherring. Local resident opposition to the removal of the “suicide” center turn lane. Per the 2010 staff memo, among the arguments against is “Without the center turn lane minor delays could be caused by vehicles making left turns into these driveways during periods of high traffic volume.” We’re talking about upwards of two hours per day, five days a week, with peak volumes while school is in session. a. The center turn lane was installed after the tornado by DeKalb County. It was not part of a mater transportation plan, nor thought out how it would be integrated with the adjoining street network. b. If logic says a center turn lane is required and necessary for this segment of Tilly Mill, then the same holds true for Mount Vernon and Chamblee-Dunwoody. c. How many homeowners along Mount Vernon and Chamblee-Dunwoody have come forward professing a requirement to install suicide center turn lanes in front of their homes? There is a known citywide preference to NOT have center turn lanes along the full lengths of these streets. I am all for the complete streets. Bike lanes and 10′ wide side walks are needed on Tilly Mill .Rd. My wife and i are in our late 40’s and have lived on Womack for 13 yrs. So happy with the added side walks the city has done so far. Keep it going. Would like to see the new side walks wider. I have found that on the old narrow side walks it can be come a little congressional when passing on coming walkers. P.s. hope the city is still planning on improving the Womack / Vermack intersection and completing the side walks on both sides of Womack. – I know a lot of my neighbors are against it, but keep going.